In 2008 I witnessed the inauguration of what has grown to become one of the most prominent public art festivals in the world, Infecting The City, a festival that hosts a range of different types of site-specific art interventions and art performances in the city of Cape Town, South Africa, creating a platform from which art becomes freely accessible to anyone and everyone. I was only in the beginning of the third year of my bachelor’s degree at the time, and still rather clueless on what direction I would like my art practice (and my career) to take, but I remember what a big impression the idea behind this festival had on me, and how I wished for even a segment of that idea to one day be experienced in my city, Dar es Salaam, Tanzania. I also wished to be one of the organizers for the Dar es Salaam version, in whatever form and scope the context would allow. This year, eight years after this experience that left a lasting impression on me, I am finally able to do so with the apexart Franchise Exhibition Beauty Salons and the Beast. Beauty Salons and the Beast is a brainchild of two artists – myself, Rehema Chachage, and Jan van Esch, who also happens to be on the management team for Nafasi Art Space, the only existing contemporary art center in Dar es Salaam. The idea developed as a response to a trend that we have noticed: that attending art exhibitions is not really a tradition for most Tanzanians. Hence, not enough locals (as compared to the expatriate audience) attend art exhibitions and other cultural events taking place in galleries and cultural centers in the city. As organizers of maybe more than 50 percent of these exhibitions, we often find ourselves wondering where this Tanzanian public is, and in what ways we can make it possible for them to access the art and the artists. After much brainstorming, we concluded that perhaps the only effective way to reach more of the public would be to borrow from the Infecting The City methodology and experiment with ‘pop-up’ art exhibitions in public spaces that draw a big concentration of Tanzanians. We say, ‘If they wont follow the art, let the art follow them;’ and we are on a mission to follow our audience wherever they may be. For this first attempt at ‘pop-up’ exhibitions, we decided to explore beauty salons and barbershops as sites for intervention, after encountering an article from which this exhibition takes its title, "Beauty Salons and the Beast" by Erick Mchome, which highlights the extent to which salons have become one of the booming businesses in the city of Dar es Salaam, and where one finds a large concentrated mix of upper, middle, and lower class Tanzanians spending their spare time, especially on weekends. (2) This is the kind of audience we have, for the longest time, been trying to gain access to. 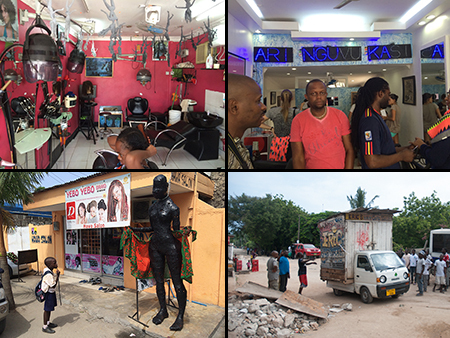 Since this is our first experimentation with ‘pop-up’ exhibitions, we thought it best to pilot it with beauty salons and barbershops around or nearby the area where we are based, and hence the choice of Msasani area – which is the administrative ward within Kinondoni district. Msasani is also placed mid-way between the peninsula, where most middle and upper class Tanzanians reside together with the expatriate community, and Msasani village, an area that was originally a fishermen’s village and still has a large concentration of lower class Tanzanians. Msasani is also easily accessible by (and most of the businesses in the area cater to) other settlers from the rest of Kinondoni district, majority of which are a mix of lower class and middle class Tanzanians. This, therefore, gives us access to a wide range of locals we would never normally see on opening nights in the art center. Like an increasing number of artists today, the artists selected for Beauty Salons and the Beast are interested in the public sphere and in questioning their role in society by using artistic media and creative expression to engage with communities to communicate, explore, and articulate issues of local significance. They employ this exhibition as a means to take art outside of the four white walls that they are used to, to access viewers other than the traditional gallery goers, and to listen to alternative views on their ‘messages’ and ‘media’ so as to develop an ‘eye’ and ‘ear’ for local aesthetics and interpretation of contemporary art. Through their interventions, they want to challenge their audience to pay attention and perceive more deeply the environment that they occupy – the situation through which their interventions are received and the resulting discourse are key elements. In a way, these artists are assuming the role of advocates (through art) for alternative perspectives that challenge assumptions, beliefs, and community values. There are many ways to draw schools of thought and meaning from one artist’s contribution to the next. As curators for Beauty Salons and the Beast, we allowed for whatever personal and distinctive interpretations that the artists may bring to the idea behind the exhibition. And although individually, each artist’s topics are highly specialized, the web of experiences stirred outside and within the mélange of the artists is expansive and mirrors the range of complexities of our nation and politics. Included in Beauty Salons and the Beast are works that grab the imagination and resonate with our immediate time and place. Most of the contributions are closely tied with the upcoming general election in October 2015, and are reflective on our 50+ years of independence and 20+ years of practicing liberal democracy with contradictions therein, one of the most endemic being how to curb corruption and abuse of office. With the voting practice in mind, the artists collectively agreed on multiple choice(s) as a starting point and the overarching theme – as a form of assessment tool in which respondents are asked to select the best possible answer (or answers) out of the choices from a list, one discovers that the answer is more often than not ‘all of the above’ – there are multiple choices. The collaboration between Jan van Esch and Aika Kirei, for example, makes use of this multiple-choice assessment tool to pose questions that address opportunities (or lack thereof) that small and medium entrepreneurs get. On the subject of elections, and following on her late father (a sociology professor and a social critic) who was believed to be the first to play with these words in the same manner, Rehema Chachage’s intervention is a wordplay, turning (and hence ridiculing) the idea behind the ruling party’s 2005 election campaign motto ARI, NGUVU, KASI (ZEAL, STRENGTH, HASTE) – which in reality they have delivered very little or the same but in the opposite direction—into an opposite, i.e., A, -NGU, -KA (ANGUKA-FALL). In a parallel but distinct fashion, the intervention by Gadi Ramadhani, which is a continuation of his Blindfolded series, depicts how (in the artist’s view) we, at present, all seem to be walking with ‘hypothetical’ blindfolds, completely unaware of how the ruling system (politicians, media, etc.) is constantly manipulating us. On the subject of choice(s) or making a choice(s), the installation with 50 Barbie dolls hanging upside down and tinted in 50 Shades of Grey, Delphine Buysse’s intervention, examines dualities in life and the difficulties that come with making choice(s), while Eneida Sanches explores the same in her intervention but from a slightly different angle. With her drawings of the missing men in her life, hers is more of a confusion and reflection about these missing men and their choice to leave her… the question being: where have they gone and what made them leave? On a more positive take on the subject, Cloud Chatanda depicts in his surreal mix of sculpture and illustration how ancient and unknown creatures that had long been frozen in Mt. Kilimanjaro are woken up to find a chaotic and imbalanced Tanzania and take it upon themselves to fight the causes of this imbalance and restore the nation back to its natural order. And in a similar manner, Amani Abeid’s intervention also exhibits a more positive take on the subject through his depiction of a Tanzanian superhero that comes forward to save the world from disaster, after all the famous, loved, and western superheroes failed to do so. Vita Malulu’s intervention, which is more of a satirical take on the subject, comments on the one-piece Kanga fabric (kanga moko) and its newly found freedom as it has recently expanded on its traditionally private and domestic use and is now seen in the streets, worn by women in broad day light. 1. Jay Pather, Curator’s Note in Infecting the City: Public Arts Festival, March 10-15, 2014, Cape Town City Centre, exhibition catalog, p. 3. 2. Eric Mchome, “Beauty Salons and the Beast,” Mail & Guardian, Dec. 12, 2011: http://mg.co.za/article/2011-12-12-beauty-salons-and-the-beast. 3. Tanner Methvin, Introductory Note in Infecting the City: Public Arts Festival, March 10-15, 2014, Cape Town City Centre, exhibition catalog, p. 2. Rehema Chachage is the Artistic Manager of programs for Nafasi Art Space, Dar es Salaam, and a mixed media artist working mostly in video and sculptural installations as well as performance. She graduated in 2009 from Michaelis School of Fine Art, University of Cape Town, where she received a Bachelors of Arts in Fine Art degree. Chachage has participated in solo and group shows throughout Africa and internationally. Jan van Esch is a Dutch cultural manager and visual artist. He holds a MA in anthropology from Radboud University in the Netherlands and a MS in public health from Harvard University. He has over 15 years experience in running organizations and is successful in strategizing, managing, and fundraising. Five years ago he changed his career towards the visual arts. In his own practice he uses recycled materials to make sculptures, drawings, and videos.